I'm just going to come right out and say it: museums are so legit. My favorites are science and technology-focused, but I usually enjoy any museum that's interactive. Recently, I made my inaugural visit to the Oakland Museum of California so I just have to share some highlights of the trip. Be sure to check out the Foley stage in the Old Hollywood section, you get to create and record the sound effects for a short film using all kinds of random props. The booth is fairly soundproof (I hope) so you're free to make a racket and a fool out of yourself. This thing is completely addicting; I'd say my friend and I did about 10 takes and eventually had to excuse ourselves once we saw a line forming outside. All of our replays were dreadful but we had a blast trying to sync the sounds to the video and creating different voices for the characters. I seriously gotta get me one of those soundproof booths, it would take my dinner parties to the next level. A jukebox and dance floor where you can boogie down to your favorite hits and then grab a seat at the diner booth and rest your tootsies -- makes me want to throw on a poodle skirt and saddle shoes and head to the closest sock hop. 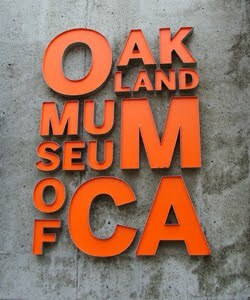 As a museum junkie, I give the Oakland Museum of California two thumbs up. It's a showcase of all things California from the origins and agriculture to the history and progressive movements. Plus, I can't be mad at any museum that encourages dancing and loud noises.